Sea Isle City: New Jersey's 19th century quaint fishing village turned popular seashore resort and charming residential community. Located in Cape May County, roughly equidistant between Atlantic City and historic Cape May, Sea Isle is a barrier island featuring beautiful, wide beaches. Nestled between bustling Ocean City to the North and Seven Mile Island to the South, Sea Isle offers it's residents and visitors small town charm with easy access to all the tourist attractions of the South Jersey Shore: The Boardwalk amusements of Ocean City and Wildwood, Atlantic City's casinos and outlet shopping, the Cape May County Zoo, the Cape May Lewes Ferry, etc. 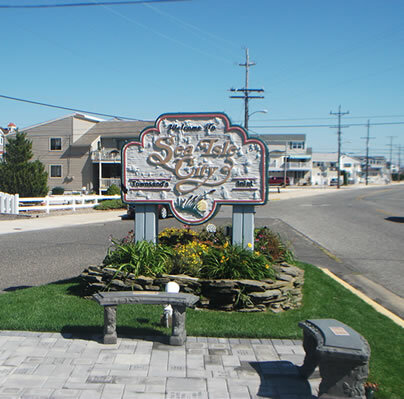 Sea Isle City, "The Sea and Sand Family Vacation Land", is a friendly resort that caters to families and welcomes them back year after year. Generation after generation gather in June for Skimmer Weekend, the official kickoff of Summer. Sea Isle is proud of its five miles of clean, white, sandy beaches that beckon its guests to frolic in its surf or laze along the shoreline. The Promenade runs along the beach and together they serve as the main hub of activity for the vacationer. Visitors are drawn to the Promenade day and night for leisurely walks, concerts, special events, shopping, biking, in line skating or just sitting and enjoying the cool ocean breezes. Summers' unofficial end is celebrated with the Fall Family Festival in mid September. Throughout the year fishing and boating opportunities abound in and around the islands' shores, back bays and waterways. Accommodations of every kind can be found throughout this resort. First class motels, cottages, condominiums, and larger more modern townhouses offer lodging to suit every taste and pocketbook. Restaurants specializing in seafood or steak are within a short walk or drive in Sea Isle City. Sara the Turtle, Sea Isle City's town mascot, symbolizes the resort's concern for the environment. Sea Isle City launched a massive campaign to save the endangered Diamondback Terrapin from extinction. "Turtle X-ing" signs have been placed in areas to warn drivers of the approaching nesting sites. This is just one of the many programs which typify this friendly, family resort. Others include holiday parades on St. Patrick's Day, Columbus Day and Halloween; the Ocean Drive Marathon and 10 Mile Island Run; Junior Olympics; Family Night Dance Parties; Philadelphia Phillies Home Run Derby; National Night Out; Little Miss Sea Isle and Little Miss Townsends Inlet Pageants; sand sculpting contest; antique auto show; Family Fun & Flick Night; and many, many more activities for young and old. "Surrounded by the sea and immense natural beauty, our island offers endless opportunities year round for you and your family to create precious memories that will capture your hearts forever."